After leaving Sea World yesterday, George and I caught a Chautauqua Airlines flight north to Knoxville, where we met up with Martin and Justin. This airport is only a few miles away from Dollywood, a park that has been on my hit list since late last year with the debut of Thunderhead (#443), a wooden twister ride built by Great Coasters International. At the time of writing, the ride is considered by many enthusiasts to be one of the finest wooden coasters on the planet. The track on this seven million dollar attraction crosses over and under itself a total of thirty two times, and indeed has one of the most, if not the most twisted layouts ever seen on a coaster. Although we were in the park at opening time and over to the ride almost immediately, it was nevertheless some three quarters of an hour later when we boarded the train. This was not due to a queue; rather, it was due to the fact that the park only started the morning testing of the ride as guests approached the station. There's no excuse for this to happen during opening hours; it should have been completed hours before. Nevertheless, the coaster itself was stunning. From the moment the train left the lift hill to the end of the course was a relentless dash around the track which felt if anything like it was getting faster, rather than slower. We were all taken aback by the Tennessee Tornado (#444). Arrow looping coasters are not known for their comfort factor. A similar era ride, Drachen Fire, was removed from Busch Gardens Williamsburg only a few years after it was built. As such, we were expecting a brutally rough ride and severe headbanging, but much to our surprise it never came. It seems that in their last years Arrow Dynamics finally learnt how to build smooth coaster rides, and this one was surprisingly good if a little short. One of the operators told us that it had originally been designed with five inversions, but had been cut back presumably to save money. The third major coaster in the park is a hybrid dark ride and coaster called Blazing Fury (#445). The experience is interesting to say the least, though the name is singularly inappropriate as all the effects therein involve water, not fire. Patrons should be warned that you will get very wet indeed on this attraction. It seemed almost rude not to ride the Dare Devil Falls log flume, which like many such rides concludes with a large splash at the end. The details of this are not entirely clear from the park web site, which refers to a 60 ft drop and 60 mph. I won't bore the reader with the mathematics (I'd get it wrong anyway) but one of those numbers must be inaccurate; sixty foot drops only have the potential energy for speeds of around 45 mph. My favourite attraction in the park turned out to be the Slidewinder raft slide. Up to five passengers sit in a small raft and travel down what is effectively a water slide chute. The passengers are weighed before boarding, as the individual rafts cannot cope with more than 650lbs weight. Martin commented that this looked horribly dangerous, and it most certainly did! The reason for this became clear on riding, as the raft negotiates some very tight turns at considerable speed; too much weight and the raft would almost certainly fly off the course completely. It should be noted, however, that this ride is extremely wet, and in all honesty probably belongs in a water park. All of us were completely drenched on disembarking, though in the hot sunshine this didn't last long. The park has recently installed a fourth coaster, the VeggieTales Side Show Spin. Unfortunately for us, it was not scheduled to open until June 17th. As a junior coaster it was hardly a major attraction, but nevertheless still qualified as an expected credit that we would be missing out. 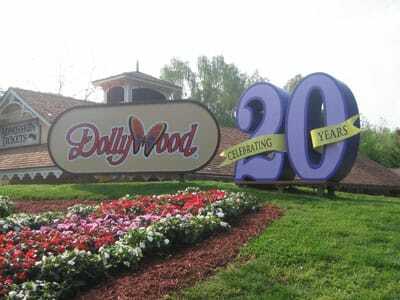 Justin elected not to join us for Lake Winnie, instead preferring to remain at Dollywood to take more photographs. George managed to fall asleep in the car, and as such poor Martin was stuck with my conversation for the entire drive. We had an interesting conversation about those who are obsessive about their coaster counts, and the definition of a powered coaster. The specific issue was what happens with such rides when a power failure occurs mid way through the course. If the train has enough momentum to make it back into the station on its own, does it then become a real roller coaster? Answers on a postcard please. There is a real sense of history about Lake Winnepesaukah, and the park is proud of that fact. Many of the older rides around the park have plaques at their entrance giving the ride history and fun facts, along the same lines as the boards at Blackpool Pleasure Beach in England. Its star coaster is a genuine piece of history in itself. 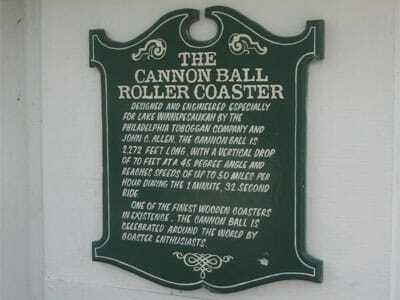 Cannon Ball (#446) is a classic wood coaster that travels down the side of the staff car park. Though designed with two trains, only one was in use today with the other under a tarpaulin. We asked if the second train could be added, but apparently the ride operators on duty today had not been trained to run the ride in that fashion. It seems probable that Lake Winnie never sees particularly large crowds, as thrill seekers would be more likely to journey to Six Flags Over Georgia, about two hours away by road. Wild mouse coasters built by L&T systems are a rare vintage, and for good reason. Wild Lightnin' (#447) takes corners at a rapid speed and with no banking whatsoever, resulting in riders being slammed into the side of the car on each occasion. This is not comfortable the first time, sore the second time, painful the third time, and oh my god that hurt the fourth time. By the fifth time, those on board have had enough and want to get off, and unfortunately there are more turns to go. In other words, this ride qualifies firmly in the useful addition to the park category. After a second ride on the Cannon Ball, we took a spin on the Carrousel (not a typo), a vintage model built by the Philadelphia Toboggan Company, before riding the last coaster in the park, a Wacky Worm (#448). Our visit to Lake Winnie was timed to coincide with an ACE event, and as such we were subjected to the two staples of that organisation. The first was a group photo, and second was a good meal. The latter took nearly two hours, largely due to the more than three hundred people queueing to get through the buffet line. Various members of the organising committee took the microphone and went through their respective thank yous. Those of us from further afield, England and Ireland, received a special mention and were asked to wave to the group. With that out of the way, the park owner took the microphone and told us an amusing story about a stray dog that had spent many years chasing the Cannon Ball and had, for a time, effectively become an unofficial park mascot. Though there was an auction at the end of the meal, we decided enough was enough, and moved back into the park to try out the Boat Chute. The ride was designed and built by the park owner in 1927, and as his grand-daughter pointed out, he had probably done this with out much formal education. It must have been particularly thrilling back then, nearly eighty years ago, but it remains no less so today. It is rides like this that have led to the development of modern day log flumes and shoot-the-chutes rides. The opening section involves a cruise through an enclosed tunnel that brings new meaning to the word "dark ride"; it is absolutely pitch black, making it impossible to see anything at all. This was hammered in completely by the fact that the boats executed a one hundred and eighty degree turn in the dark, and none of us noticed it taking place. The park is home to a dark ride called The Castle. This proved to be a generic attraction of the sort found on the fair circuits worldwide, and while it was an enjoyable experience it was unremarkable and not worthy of note. It was getting dark when I finally got around to trying the Sky Ride, a cable car attraction that travels back and forth across the lake. Unusually, the ride consists of a journey in both directions. The ride looked like it may have been designed with a station at each end, but the second one was never constructed. I was kicking myself for not riding earlier, as I could see a number of possible photographs that would have come out quite well given proper light. The night ended with a one hour exclusive session on Cannon Ball. Exclusive sessions on a coaster with a single twenty-four seater train and three hundred people are not terribly exclusive, but I still managed to get two rides in before leaving.